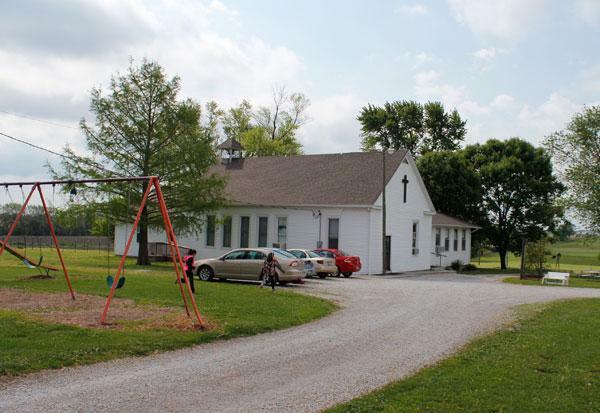 Zion Lutheran School in Lone Elm, Mo., has been around since 1896. 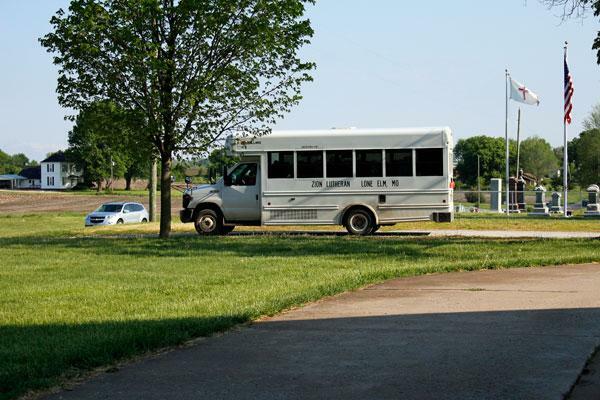 The Zion Lutheran School bus prepares to drive from Zion Lutheran Church, where students had chapel, back to the school. The church and school are down the road from each other. Andrea Petree gives students in the first, second and third grade room at Zion Lutheran School instructions for an assignment. From the entrance of Zion Lutheran School, one can see the fourth-eighth grade room on the left, and peek through the library to the first- third grade classroom on the right. For many of the students – there are usually between 28 and 38 each year – the school is part of their family history. Wieland said her family has been attending Zion Lutheran School for three generations. Not only did she and her sisters go there, but also her dad and his siblings, and her grandpa before that. 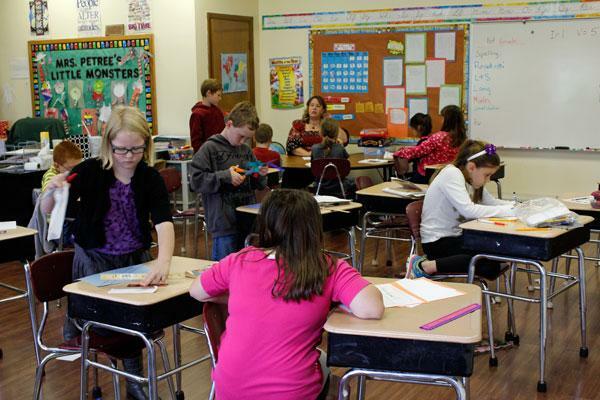 Other students have similar stories, and teacher Marcia Toellner knows them well. She started teaching at Zion Lutheran School in 1975. Marcia Toellner, one of the two teachers at Zion Lutheran School, instructs her students to re-arrange their desks to watch a movie – a special treat for the second-to-last day of school. “A couple of the kids I have now, I had their parents in school,” she said. 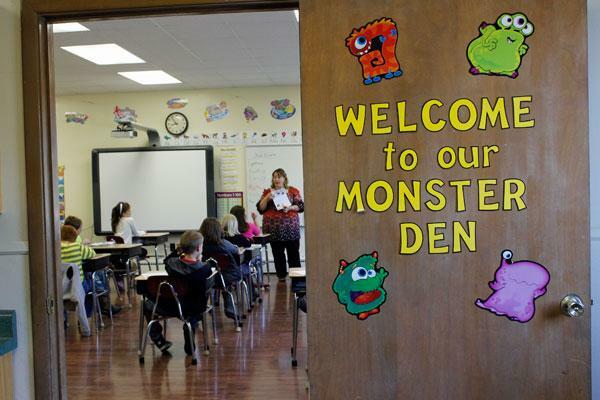 Toellner started out in the younger classroom, teaching the first, second and third-graders. She later switched to the older classroom to teach fourth through eighth grade. “Sometimes, it’s chaotic,” she said, and laughed. But she’s used to it. Toellner did her student teaching in St. Louis, but other than that, teaching in this two-room school is all she’s ever done. For a typical lesson, Toellner will go through one subject with each grade level, then move on to the next subject and do the rotation again, fourth through eighth grade. For fourth-grader Anna Thompson, being in a class with the older kids is a good way to see what she’ll be doing in just a few years – even though it doesn’t always look fun. She enjoys getting to know the older students and becoming friends with them. The older students can also help out with the younger ones. If students in the fourth through eighth classroom finish their work early, they’ll sometimes go into the younger classroom to help with reading or other activities. Both Toellner and Petree said the students become like family to one another. Second and third grade students at Zion Lutheran School keep busy while teacher Andrea Petree works with the first graders in the corner. Andrea Petree, the teacher in the first, second and third-grade room, rotates through her lessons kind of like Toellner does, but in a slightly different order. She’ll sometimes get the second and third-graders started on a lesson, and while they do a worksheet, she’ll focus on the first-graders. With grade levels combined and the emphasis on independence, it might seem like there’s not much time for student-teacher interaction. 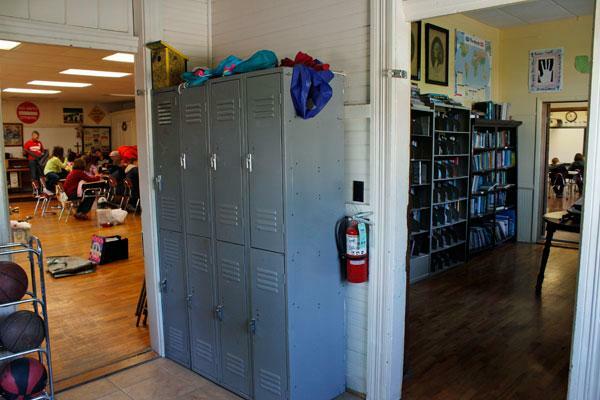 Maya Farr, an eighth grader, said one-on-one time is one of the perks of Zion Lutheran School. She went to school somewhere else until fifth grade, so she’s got something to compare to. Teachers also get a longer than usual time span with their students – multiple years, instead of just one. “I get to know my students so well,” Petree said. She used to teach at a bigger Lutheran school in Springfield, then came to Zion Lutheran School two years ago. There are also challenges to being at such a small school. Petree said as a teacher, it can get lonely at times, because there’s not the same camaraderie as there would be in a larger school – there aren’t other teachers to talk to at recess, for example. She and Toellner will chat a little at the end of the day, but that’s about it. At the same time, Petree said, there’s more flexibility. But the biggest challenge isn’t juggling the lessons, or balancing the different age groups. For Toellner, it’s watching the students leave at the end of eighth grade. 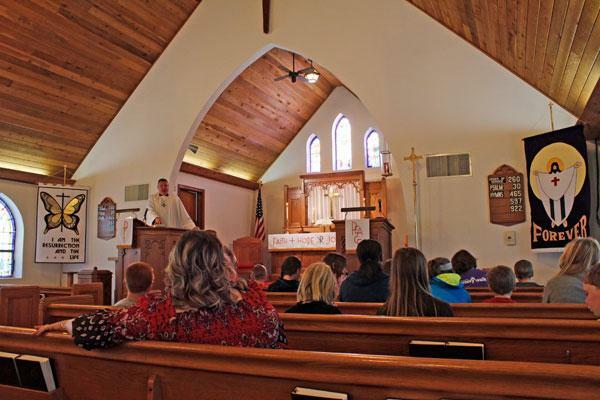 Pastor Paul Weisenborn leads a chapel service in Zion Lutheran Church for the students and teachers at Zion Lutheran School. But graduation is not always a permanent goodbye – some of the students attend Zion Lutheran Church, so those relationships will continue. The pastor of Zion Lutheran Church, Paul Weisenborn, also keeps a close connection with the school. He leads a short chapel service once a week, and he gets to know the students individually, through both the church and the school. Beyond education, a nurturing care for the students is one of the school’s top priorities. This story was produced in partnership with Columbia Faith & Values (ColumbiaFAVS.com).